While planning out the first volume of my series, I tried to brainstorm on ways the Young Guardians would acquire their superhuman abilities. I did not want to use cliches such as radioactive waste or genetic mutations. So, I turned my attention to something that transcends the laws of physics as we know it: magic. After choosing the concept of magic, I decided on what the spell should be called and I so I decided on naming it the Genesis Spell. I gave it this name because the word genesis means the beginning of something. In my characters case, the spell would signify the end of their old lives as mere mortals and the beginning of their new lives as super humans. According to Tinisha Dolaira, the Genesis Spell is a very rare form of magic that can only be used once in a sorcerer’s lifetime. What it does is awaken a being’s hidden spiritual powers and alter their appearance to the peak of human conditioning. However, the Genesis Spell only targets beings who are teenagers. As an additional side effect, the Genesis Spell also renders its targets immortal in the sense that they will never grow old, get sick, or die of natural causes, but they can be killed if their physical trauma is great enough. As of last night, I have reached the 487th page of the upcoming third volume of my Young Guardians Series. It is getting close to being complete and I estimate that it will be released sometime next year. 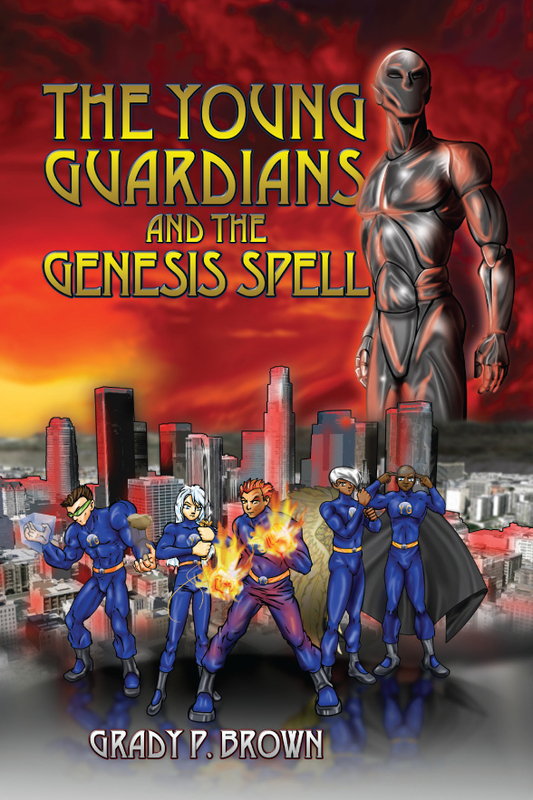 In this new book, the Young Guardians will face the main villain of the entire series for the first time while attempting to stop a plot to devastate the planet. Along the way, they gain eight more members in their battle against evil, who each have their own reasons for confronting the main villain and his minions. In this epic tale, the Young Guardians will face their greatest challenge yet. “This is an impressive book. I enjoyed reading it because the author is a gifted storyteller who has woven together a captivating and imaginative storyline. It did not take me long to read it, as I wanted to know what was going to happen next. It is a fantastic tale of 5 teenagers whose lives are turned upside-down by the appearance of an extra-terrestrial being. The dialog is authentic and fast paced, and the writing is smooth and easy to digest. The story ends in a final confrontation between the forces of good and evil that will leave the reader looking forward to the author’s next work. The best description of the book comes from the Author’s autobiographical pen. The author says that he and his friends, when in high school, always wondered what it would be like to be a superhero team and have super powers. He decided to survey his friends on what kind of powers they would like to have to fulfill their dream of saving the world and protecting the innocent. He says he based the super-villain on the bullies who harassed him at school. His book is full of “so cool” super-heroes as his imagination comes to life before your eyes. The main character is Patrick, a young man who did not yet fully understand the ways of the world. He was too unaware to know the he was entering the years in which his choices would affect the outcome of his entire life. His teen years were important times. That is because his curiosity and adolescent experience might cause him to make either the biggest mistake of his life, or the biggest difference in the world. In this book, the forces of light and darkness collide. It is an eternal story. It is a story that claims that since the dawn of time, the universe and its numerous realities have been haunted by the ghosts of its two sides. In this struggle there are two sides. For those who are righteous and benevolent, they follow the warm influence of light, willing to make their world a better place. On the other side there are those who are malevolent and unforgiving. They claim that the forces of good are weak and will soon belong to the powers of darkness. That will happen when the skies shall darken, every soul will be devoured by fire, and the power of light shall be eclipsed, never to shine again. These are the ones who are trained by the seductive power of darkness, hoping to amass as much power for themselves as possible. It is an endless battle that takes place in the Universe. Every second, each side struggles to acquire the most followers. This is an eternal story, traveling deep into the recent past, in which the powers of light and darkness converge. A few months ago, I was a guest on the Autism Live webcast Let’s Talk Autism With Shannon And Nancy, where I talked about my books and how I overcame the limitations of my condition. Enjoy! Written by Alan Moore, Watchmen invites readers into an alternate reality where superheroes exist. Most of my life, I have known about the classical superhero who has a strong moral compass, but Watchmen introduces me to a new type of superhero that is morally ambiguous. I enjoyed the character, Rorschach because he represented an individual who possessed zero tolerance of evil even in the face of Armageddon. With Doctor Manhattan, I witness a person who wields unlimited power and immortality and as a result becomes detached to the mortals around him. The villain is what I would categorize as a gray character because his intentions to unify the world were good, but the price he was willing to pay to make that happen was too high. I enjoyed the complexities of his plan and the steps he took to make his goal a reality. What this graphic novel shows its audience is that the world is not as black and white as most people think. Instead, it consists of different shades of gray with individuals who are neither good nor evil, but in between. I would recommend this graphic novel for anyone who is searching for an elaborate and intriguing story. As a devout science fiction fanatic, I have always been fascinated by the idea of combining man with machine. In many ways, cyborgs make me think of Kurzweil’s theory of transhumanism in which humans would eventually evolve into machines or transfer their consciousness into a computer system. When I developed Cyber Shadow’s character, I wanted to create my own cybernetic character. However, as advanced as this technology may sound, there are bound to be a few defects. One example would be that the organic components of the cyborg would reject the robotic parts just as a metal plate can be rejected by a person’s body. Another example is that there would be a chance that the cyborg’s only senses would be seeing and hearing while their remaining senses would be either gone or diluted. A third example would be that the cyborg may not require food because they may not have either a mouth or digestive system, but would have the subconscious need to feed, which would result in constant hunger that they could never satisfy. While depicting Cyber Shadow, I tried to illustrate on the psychological impact these defects can have on him. In Cyber Shadow’s case, the only organic component in him is his brain, so when his brain is implanted into his robotic body, his brain suffers considerable mental strain as it struggles to adapt to its new physical conditioning. Before he became a cyborg, Cyber Shadow was a sadistic school bully who was already mentally unstable and the defects of his cybernetics only exacerbates these traits. With these flaws in his psyche, I drew inspiration for Cyber Shadow’s personality from the bullies who harassed me throughout middle and high school and the disturbed android Roy Batty from Blade Runner, who was also a product of the inevitable mistakes that human technology would generate. Overall, whenever one is developing new technology, they should be cautious about the effects it would have on the people they are trying to sell it to otherwise the consequences would be disastrous. I have been a connoisseur of fantasy and fiction all my life and, as a result, I have grown fond of a number of mythological creatures. Among them are high elves, which have been described as the fairest of all beings, which could be an indication of angels without wings. In almost every sword and sorcery story, elves have been depicted as being wiser and more knowledgeable than other beings. For the longest time, I have admired the inhuman beauty and wondrous power that elves possessed. With such tremendous abilities and dashing good looks, I thought that elves would make the perfect superhero and so I applied that idea into my work when I created Tinisha Dolaira, making her a member of the superhero team known as the Young Guardians. While developing the characters for my series, I wondered what would happen if a high elf, who has been born and raised in a world where magic reigns supreme, is taken out of their comfort zone and placed in twenty-first century Earth. They would be morally wise with strong ideals, but would be inexperienced about how the modern world operates. I wanted to depict how such a scenario would occur and how the elf in question would survive in such an unfamiliar environment.